On the last of our 3 days in Kyoto, we decided to explore the Arashiyama district, a mountainous, forested region in the western outskirts of the city. We were initially drawn to this popular sightseeing district by photos of its famous bamboo grove, but quickly discovered that Arashiyama has far more to offer, both in terms of nature and culture. During our self-guided tour of Arashiyama, we strolled through the gardens of a Zen temple, sipped tea at the villa of a Japanese film star, hiked up a hill that’s home to wild monkeys, and walked with wonder down a bamboo shaded path. Here’s a closer look at what we managed to see and do in Arashiyama! Tenryū-ji is the most important temple in Arashiyama. It’s a major temple of the Rinzai Zen sect of Japanese Buddhism and part of the UNESCO World Heritage Site designation for Kyoto’s historic monuments. Tenryū-ji Temple was built in 1339 by shogun Ashikaga Takauji, a gesture to appease the uneasy spirits of Emperor Go-Daigo, who had just passed away. Over the years, Tenryū-ji’s buildings were destroyed by fire and rebuilt, so most of the current halls date from about 1900. It wasn’t the temple buildings that interested us as much as the landscaped garden. In fact, we skipped visiting the inside of the temple in favour of more time to explore the forested grounds. So pretty! Tenryū-ji’s garden has survived since the 14th century in its original form. The centerpiece is the Sogenchi Garden, a large pond surrounded by rocks, pine trees, and backed by the Arashiyama mountains. In the springtime, Tenryū-ji Temple is one of many great cherry blossom viewing spots in Kyoto, thanks to the large cherry trees. The paths were especially pretty when partially covered by fallen pink blossoms. 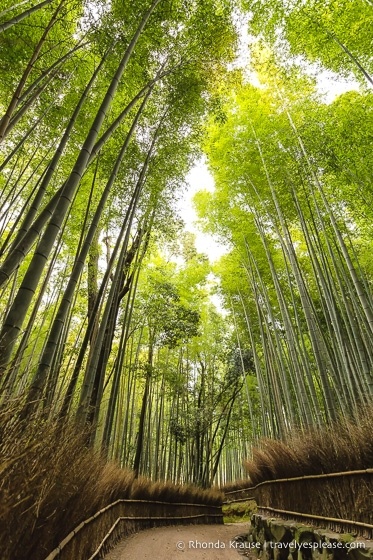 The Arashiyama Bamboo Grove is the most well known of Arashiyama’s tourist sites and a very popular photo location. When you exit from the north gate of Tenryū-ji Temple, you’ll find yourself near the heart of the bamboo grove. A short lane then cuts through the grove, passing by towering stalks of gently swaying bamboo, before arriving at the entrance of Ōkōchi Sansō. The grove, while smaller in size than I was expecting from pictures, is actually quite dense, blocking much of the sunlight from above. I’m curious to know how many bamboo stalks there are in the immediate vicinity of the path. Probably thousands! Ōkōchi Sansō is not on the radar of most tourists, but we thought it was a real treasure. This small villa was the private home of Ōkōchi Denjiro (1896-1962), a Japanese actor known for his starring roles in samurai films and other period dramas. The property has several lovely small gardens and a few buildings that can only be viewed from the outside. There are also two scenic viewpoints- one overlooking the city, and another offering views of the mountains and Hozu River gorge. Admission was a bit expensive at ¥1,000 ($10 CAD), but that included a cup of matcha tea and a Japanese cookie. The tea house is a delightful place to rest, looking directly out onto the bamboo grove. Tōgetsukyō, the “Moon Crossing Bridge”, is another of Arashiyama’s notable landmarks. It was originally built during the Heian Period (794-1185) but today’s version dates from the 1930s. While the bridge itself is quite simple in design, it’s the forested mountainside in the background that makes this location so attractive. At the end of the bridge there’s a nice riverside park where we enjoyed watching people row around in little blue boats. Had we not also wanted to visit Fushimi Inari Shrine later that afternoon, we would have definitely rented a rowboat and spent some time relaxing out on the water. The last place we visited in Arashiyama was the Iwatayama Monkey Park. It’s an uphill hike to get there, but well worth the effort to see so many monkeys roaming freely on the mountaintop. Not only was it fun to get to hang out with cute monkeys, there was a fine panoramic view of Kyoto from here. Since I’m such an animal lover, the Iwatayama Monkey Park was the highlight of our visit to Arashiyama. We very much enjoyed our trip to the Arashiyama district of Kyoto and had a lovely, leisurely day exploring the main sites. Sure, it was touristy on the main street, and busy at the bamboo grove and Tenryū-ji Temple, but somehow that didn’t detract from Arashiyama’s likability. There was plenty of natural beauty and scenic views to enjoy, especially during cherry blossom season. I’d like to return here in the autumn one day because I bet the hills are stunning once the leaves turn colour. Without a doubt, Arashiyama is worth visiting during a trip to Kyoto! Getting There: Arashiyama is about 8 kms west of the city centre. From Kyoto station, take the JR Sagano Line to Saga-Arashiyama Station. The train ride should take about 15 minutes, then it’s a 10-15 minute walk to central Arashiyama. Getting Around: We were able to walk to every place we visited in Arashiyama. Tenryū-ji Temple, the bamboo grove and Ōkōchi Sansō are very close together. The monkey park was the furthest away. Planning Your Visit: I always recommend arriving early to avoid the crowds. From the train station, we went directly to the bamboo grove and managed to have a few peaceful moments before more people started to arrive. We then backtracked to Tenryū-ji Temple because this also gets busy later in the day. After Tenryū-ji Temple, we took another walk down the main path at the bamboo grove and visited Ōkōchi Sansō. From there we made our way to Tōgetsukyō Bridge and then the monkey park on the other side of the river. We spent almost a full day in Arashiyama and thought that was sufficient for visiting the main attractions in Arashiyama. Tenryū-ji Temple: Tenryū-ji is open daily from 8:30 am- 5:30 pm in the summer and until 5:00 pm in the winter (late October- late March). Admission fee to the garden is ¥500. It’s an additional ¥300 to also visit the temple buildings. Ōkōchi Sansō: Ōkōchi Sansō is open daily from 9:00 am- 5:00 pm. Iwatayama Monkey Park: Iwatayama Monkey Park is open from 9:00 am- 5:00 pm (March 15- September 30) and 9:00 am- 4:30 pm (October 1- March 14). It’s closed during heavy rain and snow. For your convenience, here is a list of hotels in Arashiyama and central Kyoto. Please consider booking your Kyoto accommodations through the included link. It costs nothing extra and helps support this website. Thank you!